Molly McCarthy of Brule, Wisconsin worked for 20 years at the refinery when it was owned by Murphy Oil, and during that time she developed what she calls a "healthy respect" for the unit containing hydrogen fluoride. "I didn’t mind working with it," said McCarthy. 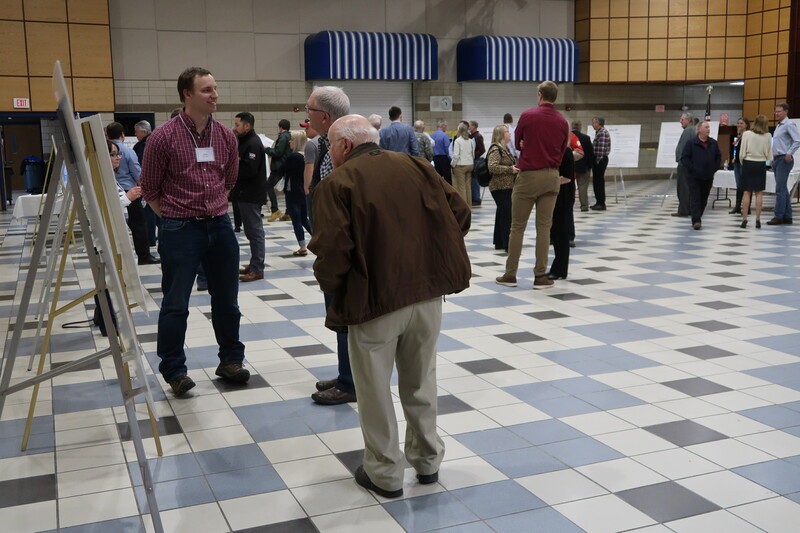 The 70 year-old retiree was among community members that turned out to an open-house-like town hall meeting hosted by Canadian firm Husky Energy Inc. at the Superior Middle School on Tuesday evening. 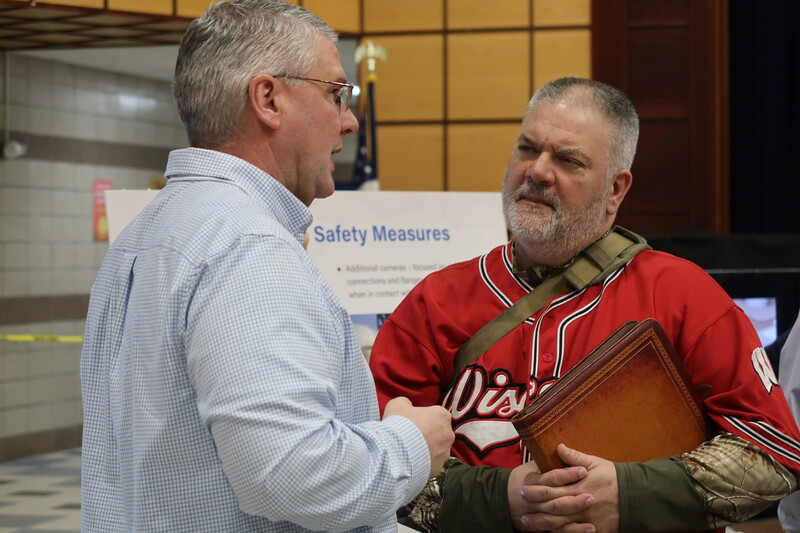 The company shared its $400 million plans to rebuild the refinery after an explosion and series of fires there last spring. McCarthy said she wants to see the refinery rebuilt, calling it an asset to the community. However, she said Husky was lucky the explosion downstream from the refinery’s fluid catalytic cracking unit didn’t result in more severe injuries or damage. "The worst-case scenario actually happened. They had a reversal and it sparked and blew and the acid tank was not breached. I was amazed," McCarthy said chuckling. "The place is built on a four-leaf clover." The acid tank McCarthy is referring to is the tank that held 15,000 pounds of hydrogen fluoride (HF), which is a chemical the refinery has said is vital to its operation. The highly toxic chemical caused a temporary evacuation of residents last April because it can be hazardous to human health if released. Debris from the explosion came within 150 feet of the tank, but it wasn't compromised. The company announced earlier this month its plans to continue using the chemical in its refining process to produce high-octane gasoline. "The HF alkylation is a vital component of that motor gasoline," said Kollin Schade, refinery manager. "Right now, we are intending to maintain that operation. However, we are very happy with the safety processes that we had in last year that worked as designed. Going forward, we’re going to bolster those even more with additional safety processes." Those measures include installation of a rapid acid transfer system that can be activated in the event of any release of hydrogen flouride, which would transfer the chemical to a separate holding tank. The company is also proposing enhanced leak detection, as well as additional layers in its water system that include a water curtain and two water cannons already in place. But, Superior resident Andre Letendre wants the company to do more than that and stop using the chemical altogether. "Stay in Superior. Keep spending money here. Keep the jobs here. We’re proud of the fact that Husky is here doing things. Please do better," said Letendre. "We want to be very proud of what you do. We want you guys to be setting an example for refineries across the country. Right now, you have the opportunity to do that and you’re going with status quo." However, Northern Wisconsin Building and Construction Trades President Kyle Bukovich said he believes Husky will do better. Bukovich, whose family and friends have worked at the refinery, said the rebuild brings economic opportunity to the city and employs union workers. "When an incident happens, there’s always new ideas on how we can make stuff safer," said Bukovich. "I think with all the trades being in contact with Husky I think there’s going to be a good plan going forward." Bukovich said it’s a miracle that no one was killed in the explosion and fires last year. But, Duluth resident Jo Haberman doesn’t have as much faith in the company’s ability to protect the community. She also wants to see the company transition away from the use of hydrogen fluoride to safer alternatives. "It’s wonderful to have companies in the area. It’s wonderful to have jobs in the community. I’m not objecting to that, but they need to do it safely," she said Tuesday night. "They need to do it in a way that protects the public, protects the community and protects the workers." Across town, Superior resident and Cooper Elementary School teacher Brett Gunderson pleaded with the city council to do whatever they could to protect his three children and others. He evacuated kids to the Amsoil arena in Superior last April. "Had that chemical, hydrogen fluoride, been released, those kids had nowhere to go," said Gunderson. Superior Mayor Jim Paine said he’d like to see the chemical removed from the refinery, but he noted that refineries typically don’t transition away from hydrogen fluoride. But, he said that doesn’t mean Superior can’t be the first. "Some people in the public really care about this," he said. "We need to do a good job of showing them that all parties involved ... are doing everything possible to keep them safe. Right now, I believe the public is safe." The refinery is continuing work on demolition, and Schade said they hope to be able to begin rebuilding this fall and resume partial operations in 2020.